Early modern men and women represented their lives very differently from twentieth-century autobiographers, sharing none of the current preoccupation with individuality and the unique self. The writers represented in this two-volume collection sought connections between particular events in their lives and the larger pattern of Christian salvation. The texts reproduced here are united in the way they interconnect personal experiences and feelings with scriptural passages in an attempt to understand daily life in spiritual terms. Almost all the women whose works appear in these volumes would have been considered religious radicals by their contemporaries. Living through the turbulent times of the English Revolution (1642-1660) it is unsurprising that their life writings are marked by a sense of persecution. Many of them spent time in prison: Katherine Evans, Sarah Cheevers and Barbara Blaugdane were all imprisoned for preaching the faith of The Society of Friends, while Mary Rowlandson spent several months as a captive of North American Indians. 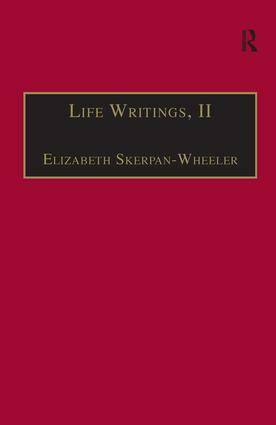 In her introduction to these writings, Elizabeth Skerpan-Wheeler provides brief biographical sketches of these writers, together with details of the publication history of each text. With the exception of Rowlandson's works, the writings in these volumes are the first complete, unabridged editions in modern times. Contents; Introductory Note; Theodosia Alleine, ’A Full Narrative’ (in The Life and Death of Mr. Joseph Alleine); Anne Wentworth, A True Account, A Vindication; Mary Penington, ’Mary Penington her Testimony’ (in Works of the Long-Mournful and Sorely Distressed Isaac Penington) Mary Rowlandson, A True History (London, 1682); Hannah Allen, A Narrative of God’s Gracious Dealings; Barbara Blaugdone, An Account of the Travels; Susannah Blandford, A Small Account.